The story of how Steps 2 Health commenced back in the mid 1970s. Little did we know back then that the situation that initiated the formation of Steps 2 Health would have far reaching beneficial impacts on the lives of many many thousands of people. As a family my two parents and five children living in the Lower Blue Mountains, we ate what most Australians ate each day; processed breakfast cereals, white bread sandwiches and evening meals consisting of a meat dish and three vegetables. Though we always had apples, oranges and bananas, we had never juiced or tasted fresh vegetable juices. In the mid 1970s a family friend handed my father a little book titled ‘Make your juicer your drug store’ by Dr L Newman. At the time, we had no idea of the significance the information in the book would have on us for the rest of our lives. Not long after receiving the book, my father travelled to the United States on a business trip. Feeling unwell on the trip, my father visited a doctor, and following a number of tests was given the diagnosis of advanced bowel cancer. My father was in his mid 40s. 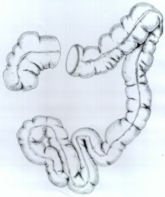 On the left is a drawing of a healthy large intestine or colon, and the drawing on the right is the large intestine of my father when x-rayed after taking a barium meal. 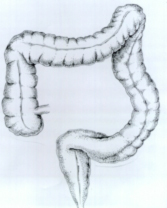 The artist who copied the drawings from an x-ray drew a cross-section of the diseased colon to show my father had chronic constipation. Having recently read the little book on vegetable juices, my father took opportunity while in the United States to visit a ‘natural health clinic’ to seek their advice on what he could do to improve his lifestyle. The doctors at the health clinic educated my father in vegetable juicing, colonic irrigations, the taking of food enzymes to ensure all foods consumed were fully digested to maximize nutrient absorption into the cells, and vitamin supplements. To follow the doctors advice meant our family had to make some drastic changes. Our pantry contained a lot of processed foods. For our family we were embarking upon a new way of living. As a family we really didn’t know too much about strict ‘healthy’ diets. To learn about juicing and holistic health, my parents purchased a number of ‘health’ books, a centrifugal juicer, and knowing my father needed foods with very high nutrient content we commenced to grow our own wheat grass shoots in trays in the kitchen. Wheat grass is one of the highest food sources of vital nutrients. We grew wheat grass from wheat grains in trays in the kitchen. We did not have a wheat grass juicer so my dad would cut the wheatgrass when it was about 15 cm long and chew the grass, swallow the liquid and spit out the fibre. To support the radical change in the lifestyle of my father, our family also needed to change the way we were living. My mother cleaned the pantry out of all processed foods, emptied the ‘meat’ freezer which was full of cuts of different meats, and commenced to prepare meals that consisted mostly of salads and freshly juiced vegetable juice. To compliment the diet and fresh vegetable juices, my father also took digestive enzymes, vitamins and colonic irrigations. My father did not deviate from his strict diet, and after many months my father’s health slowly improved. 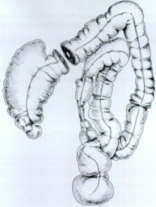 The drawing left was copied from an x-ray of my fathers large intestine 2-3 years after the first x-rays. The artist who drew the drawing cross-sectioned the picture to illustrate that resulting from my father’s lifestyle changes, he was no longer constipated. Realising the enormous benefits a change in lifestyle provides, when well enough, my father trained as a naturopath so that he in turn he could share what he learned about good health with others in need of lifestyle advice. In the late 1970s my father commenced a naturopathic practice at Northmead NSW. Working in his busy practice, my father noticed that most patients were in need of a diet high in nutrients and better elimination of dietary wastes from the intestines. The Wheat Grass Powder and Fibre Powder we sell were developed out his experiences in his naturopathic practice. My father continued to work in this practice for the next 28 years educating patients in the Steps 2 Health.